Just as Donald Trump's victorious campaign for the US presidency shocked the world, the seemingly sudden national prominence of white supremacists, xenophobes, militia leaders, and mysterious "alt-right" figures mystifies many. But the American extreme right has been growing steadily in number and influence since the 1990s with the rise of patriot militias. Following 9/11, conspiracy theorists found fresh life; and in virulent reaction to the first black US president, militant racists have come out of the woodwork. Nurtured by a powerful right-wing media sector in radio, TV, and online, the far right, Tea Party movement conservatives, and Republican activists found common ground. Figures such as Stephen Bannon, Milo Yiannopoulos, and Alex Jones, once rightly dismissed as cranks, now haunt the reports of mainstream journalism. Investigative reporter David Neiwert has been tracking extremists for more than two decades. 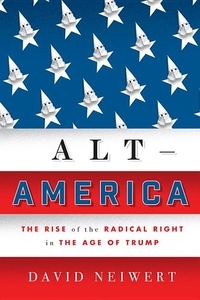 In Alt-America, he provides a deeply researched and authoritative report on the growth of fascism and far-right terrorism, the violence of which in the last decade has surpassed anything inspired by Islamist or other ideologies in the United States. The product of years of reportage, and including the most in-depth investigation of Trump's ties to the far right, this is a crucial book about one of the most disturbing aspects of American society.